Standing outside the hab on 2015.9.9. Life as we know it stands opposition to a constant downward force. Even high-flying objects like the International Space Station are falling fast. The ISS stays aloft because it’s travelling forward at just the right speed* that, by the time it would crash, Earth’s surface has curved away. The same principle is true for those of us on the ground. Even standing still, we experience a pull towards the center of the Earth. Fortunately, an equal and opposite force holds us up(the normal force). The ground is firm beneath our feet, catching us… right up until the moment it isn’t, which is what happened this month. That’s a fancy way of saying that in the last 30 days, the skies broke open, the ground vanished, and things changed. Humanity broke records. In just one example, 18,000 of my fellow Americans applied to be astronauts. That’s more than twice the number that tossed their hats into the ring during the Apollo Era, when we were mad to beat the Russians, to leave footprints and flags on the Moon, to make our indelible mark on history. These days, we live in space with the Russians. We get to the ISS using their Soyuz rockets. We haven’t been to the Moon in a generation (ancient history, to some). Given all that, what does it mean that SO MANY would change out promising careers in research, aerospace, medicine, and the military for a $60k-a-year gig wearing a blue jumpsuit? Maybe it’s for the same reason that I and every eligible member of my crew applied to the corps: so that we can spend the rest of our lives hanging out with you all, talking about science, getting people excited about space – a peaceful, hopeful activity that the world can get behind – moving our species forward into an era of fulfillment and discovery. For all its difficulties and dangers, looking up sounds like a pretty good way to spend a lifetime. Speaking of dangers, almost a month ago, gravity and I had a bit of a run-in. 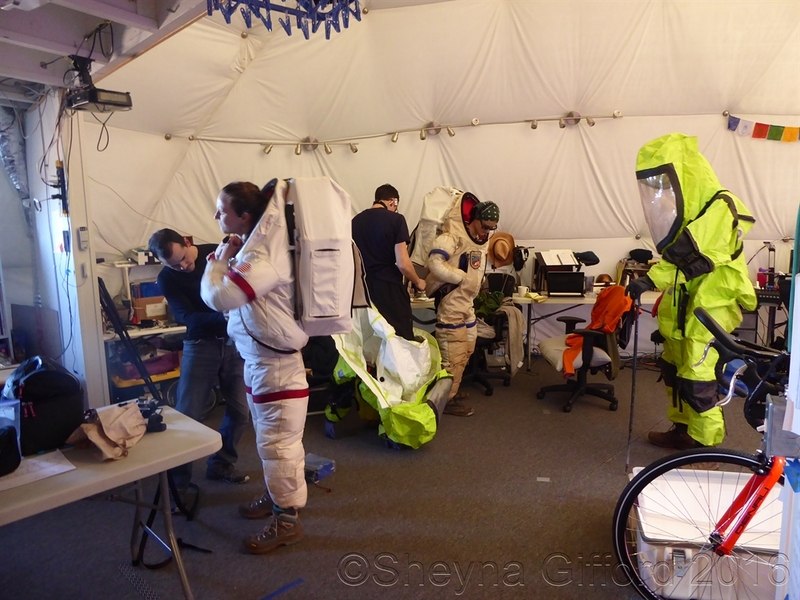 Much like real Martians will one day, simulated Martians do a lot of suiting up and going for walks. 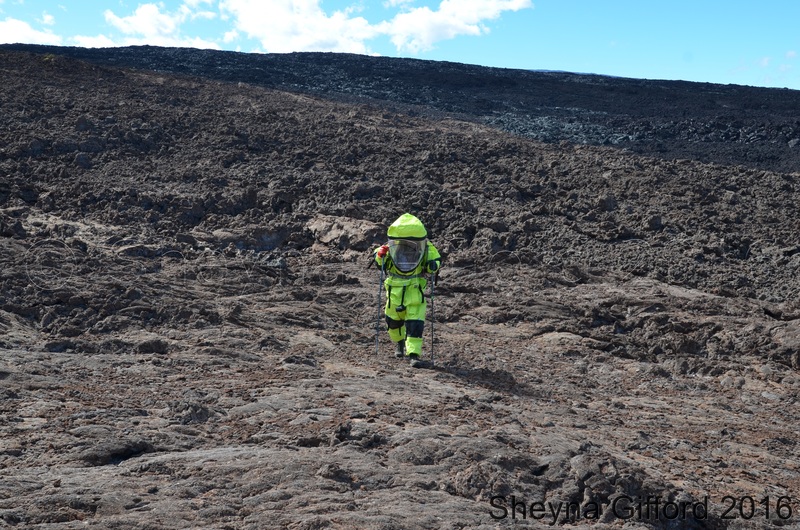 During these walks, or EVAs, we take various measurements and samples. In this function, we’re about a million times more efficient and nimble than a Mars rover. However, we are just as susceptible to accidents. In the middle of a geology task for mission control, I was standing perfectly still on the side of a wide lava channel, looking for a way over, when, suddenly, the solid-looking formation beneath my feet collapsed. Fortunately, I didn’t fall far. A split-second of acceleration and velocity later, the bottoms of my feet hit even an older lava bed. My right knee struck a rock, and I came to a stop. 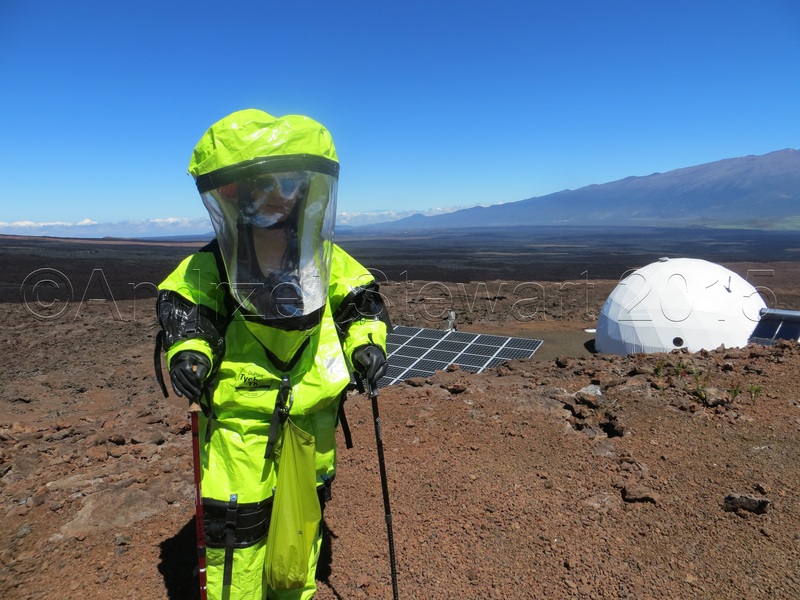 If someone had been filming the scene, it would have looked like the Earth decided to swallow me whole and changed its mind halfway through (it probably didn’t like the taste of my Tyvek® spacesuit). With the aid of two trekking poles (indispensable on any planet), I hauled myself out of the human-shaped hole and back up to the hab. Falls, even short ones, are no joke. According to the CDC, they account for 10% of occupational deaths. These falls usually happen on construction sites, from buildings or scaffolds. They can be prevented, at least in part, by use of tethers. Sometimes, they can be arrested with nets. As anyone who has worked on a rig, on a ship, or in mining/agriculture/forestry can tell you, tethers and nets don’t travel well. There’s only so much that you can do to prevent falls or catch someone who’s falling in the field. This is something to bear in mind when we’re packing people off to places with gravity. When it comes to suit design, lighter and tougher is better. My suit did its job admirably. Two-hundred-year-old lava rock can be as sharp as broken glass, smooth as paving stones, or anywhere in between. This rock face was more like the former, but the suit’s plastic yellow exterior bore the brunt of the rock’s rage. In its wake, the only damage to my leg was from the impact of the fall itself on my knee. I was able to walk. A month later, I can run a mile. What I still can’t do is climb. Which is how I ended up alone on sMars. Yesterday, simulated Mars experienced a simulated radiation storm. On Mars, the best place to hide during these events is in a cave. Fortunately, on this mountain, we have many. The ideal cave in which to hide from fast-moving solar particles has a small opening and a center big enough to house six people, standing up or sitting down, for as many hours as it takes for the storm to pass (or, on Mars, until nightfall, when the planet itself acts as a big, round radiation shield). Roughly a kilometer north-northeast of the hab, there is exactly this kind of formation: a huge cave, entered by crawling over some boulders, then scrabbling down a steep slope. At the base is a large, flat area, big enough to accommodate the six of us for 12 hours. However, during this particular storm, thanks to gravity, only five of us were in peak climbing condition. 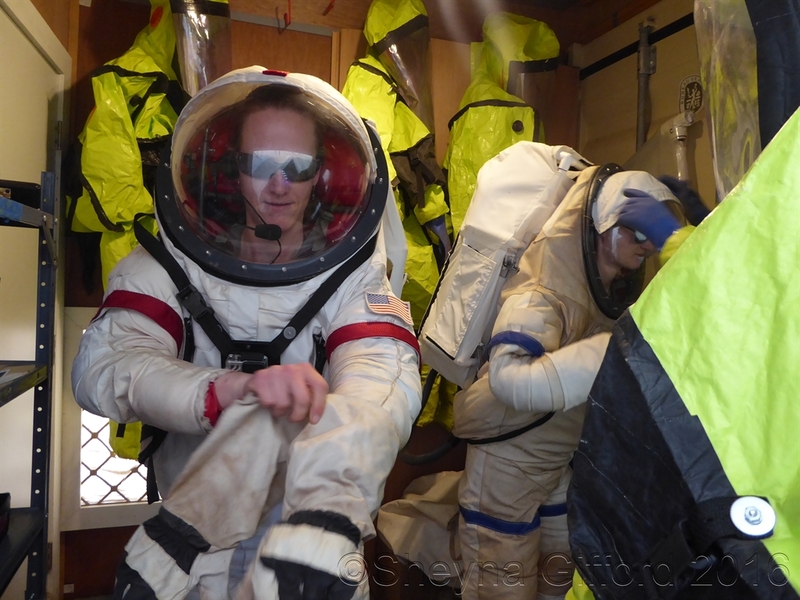 So, while my entire crew hiked off to hide in a cave from a simulated radiation storm, I stayed behind, and rode out half a day alone in the habitat. It was quite the Mark Watney moment. 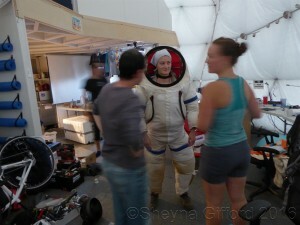 Being the only one in the hab for a day was a first – for me, certainly, and for the mission in general, I believe. “You’re probably wondering what someone who normally has five flatmates does when no one else is home. The answer, if you’re on Earth, might be: throw a party. The answer, if you’re on Mars, is: do what everyone else would be doing if they were here. Sunday is our normal cleaning day. 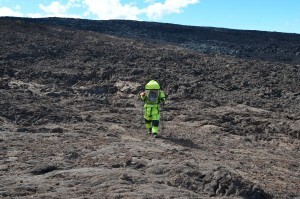 With my crew hunkered down under several tons of lava rock, someone had to see to the kitchen, carpet, and bathrooms. Not to mention the food. Hiking and hiding is hungry work. The person whose cook day it was was currently indisposed on account of a deadly solar radiation drill. So, making sushi and clean the dome came first. After THAT, I got to play. Specifically, play my didgeridoo, loudly, in the common area. 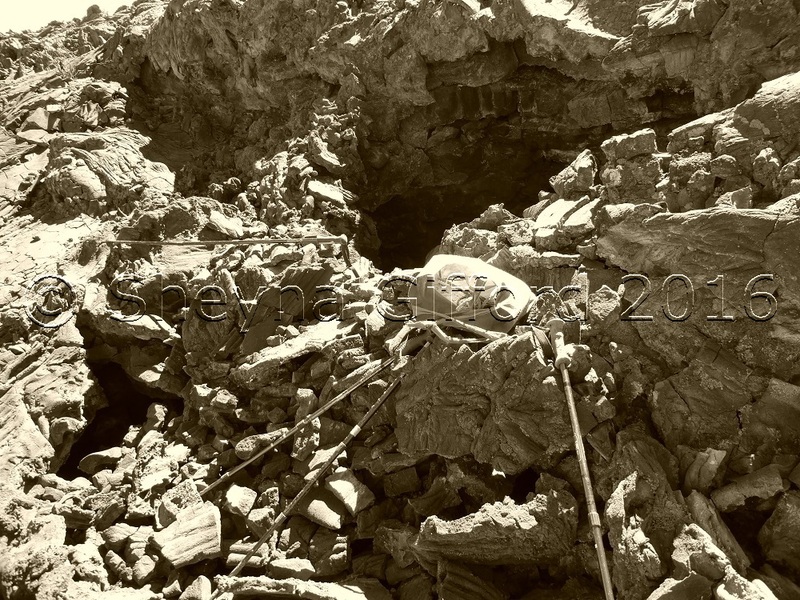 The crew’s gear outside a cave in the nearby lava fields. The other thing I got to do while everyone was gone was practice sword in the main area during the day. Swinging any kind of stick in a small, enclosed space in the presence of others is generally discouraged – unless the others happen to be doing it, too, in sync with you. As I am the only Japanese-style swordfighter on Mars, I usually stick to waving my stick around late at night, when everyone else is upstairs. To have a day to practice in the the glow of the dome was quite lovely. The sun shone through the fabric seams in the curved dome ceiling, lighting up long lines that the wooden sword-tip swung through easily. It was like practicing sword in the center of an illuminated globe. 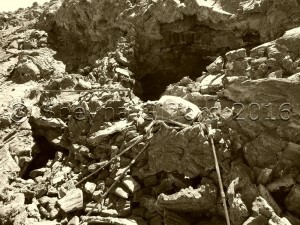 I would probably never have experienced it if I hadn’t fallen into that hole in the Earth. Making discoveries, breaking legs, breaking mountainside, breaking records: that’s been that kind of month. A really good month, all things considered. My apologies for not blogging here as often. The posts have been going up on Aeon and Nautil.us, and will probably be posting to a few other places in the near future. Speaking of future – we’re five days from the halfway point in our mission. It’s been nearly six months! I’ll post again about reaching the halfway mark – and beginning the dreaded 3rd quarter – in short order. Until then, be well, and may there always be someone, or something, there to catch you, gently, when you fall. Andrzej Stewart walks across the lava fields. Glad you’re okay. Do you run a mile outside while wearing your eva suit? As I typed that, I realized it’s probably a treadmill situation inside. Meanwhile, I am imagining a virtual duet – you blowing an approximation of the Doctor Who rhythm on digeridoo while I play the “melody” on ukulele. Both of us wearing Doctor Who scarves. My dig skills are pretty crude. It would be an epic duet. Loved the article, great read – interesting and amusing! Great post! You know that everyone wants to be an astronaut now because of the movie about being marooned on Mars! I enjoyed your comments about being alone in the house, being alone is so wonderful as long as it’s not all the time. I noticed that the scenery is similar to a Martian landscape. I understand that radiation is a grave concern on Mars or anyware outside Earth’s biosphere//magnetic field. Mars does have alot of cave systems which colonists could use for habitats. I wonder if there is anyway we could erect an artificial magnetic field around their habitat? Waste water could act as a barrier also. Have it circulate around the outside of the habitat between layers of the shell. Water is an excellent radiation shield. Hope everyone on simMars is doing well. Later. We’re doing well, thanks Mike! As maintaining magnetic fields take energy, waste water is more likely – or, ice water. The 3D printed Martian ice habitats would provide excellent radiation shielding, while allowing a lot of light in. We’re looking forward to seeing what the space architects come up with. Great work you all are doing, very excited to read about it.Thanks for sharing. I am so glad I found your blog. All the best! Glad you didn’t break anything in your fall! Apparently you were out there alone? I understand the “storm” was a simulation. What if it were real? Is there a way to shelter in place for one in the dome, or would the others have had to carry you with them somehow to the cave shelter? Hi Amy! If the storm were real, we would have had 4 or 5 days of warning. With a very few exception, storms take a while to reach Earth, and then another couple of days to reach Mars: long enough for us to move all of the Mars satellites to the far side of the planet, which then acts as a shield against solar radiation. That brings us to the second part of my answer: if it were real, but the storm arrived at night, a Mars crew might not have to do anything. Unlike Earth, Mars has no planet-wide magnetic field. On the one hand, this means we aren’t very well protected. On the other, it also means that there’s no forcefield that can wrap around the planet and bring the radiation to the dark side. As long as it’s night on Mars, you are safe from solar radiation. As to where we would shelter from a storm that arrived during the day, that would depend on what kind of storm. By the time solar storms reach Mars, we know all about them. We know how strong they are, and how many particles are in them, and what energies those particles have. It’s like knowing all about an avalanche days before it gets to you. If it’s a lot of little particles moving slowly, you walk away. If it’s a lot of big boulders moving quickly, you RUN. Depending on the size and type of storm, we would either shelter in place, moving sensitive electronics and experiments into a more shielded part of the dome, or we would hide all that under the watertanks and make a break for it.